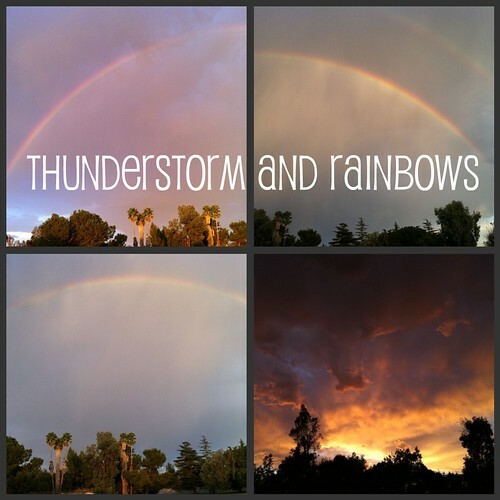 Thunderstorm and Rainbows, originally uploaded by dewelch. We were out in at the Woodley Park Archery Range this evening when a pop-up thunderstorm rolled across the San Fernando Valley. The rainbows were quite striking, as was the sunset as the clouds rolled west.. The iPhone really doesn’t do the rainbows justice, but it is nice to have collected a few movies. All of our pictures from Sicily now available! Cupcake Camp LA – September 28, 2010 – Not exactly an unconference, but a fundraiser for charity, so still a good cause. $15 per person for 5 cupcake tasting in 2 sessions. Sponsored by http://bakespace.com and Scharffen Berger chooclate. Chocolate Peanut Butter Cups – September 27, 2010 – Oooooo— peanut butter, chocolate, marshmallow AND puff pastry. Was this recipe especially created for me? This is probably a bit more complex than I typically make for the annual cookie party, but it sure sounds good. I bet it would be a big hit with my friends, too. It's Not About What You Do, But Why You Do It [Video] – September 27, 2010 – Not enough people ask that all important question, “Why?” We see it every day. People doing the same thing over and over even though it is no longer useful or even advised. Adding this video to my “To Watch” queue. After 121 years, the Rose Parade changes its name, sells corporate sponsorship – September 27, 2010 – Surely there had to be a better way to promote Honda’s sponsorship than changing the name of the event. Judging by the comments on the blog post, this isn’t going to sit well with anyone but the ToR and Honda. Without popular support, it could endanger the continued existence of the parade itself. One commenter pointed out the volunteers might not be so forthcoming for a heavily branded event. I know I personally have stopped volunteering at entities (National Forest Service) when it instituted policies I did not agree with and I am disinclined to volunteer for events and organizations who give over a large amount of control to corporate interests and naming. Time will tell, I guess. Crinkle-Faced Ginger Monsters – Recipe Detail – BakeSpace.com – September 26, 2010 – More possible cookies for the Christmas Cookie Party. Bakespace: Pumpkin Maple Buttercream Sandwich Cookies: – Recipe Detail – BakeSpace.com – September 26, 2010 – Another good cookie idea for try out this Christmas for our holiday party, I think. Chicken & Potato Chowder – September 26, 2010 – Just waiting for the Fall temperatures to arrive so we can bring some soups back into our meal plans. This one is similar to something we already make, but just different enough to make it worth trying out. Due to my own proclivities I will probably swap out the mixed veg with something else I prefer. Video: Soarin' Over the Santa Monica Mountains in a Hang Glider – September 24, 2010 – Amazing footage of the wonders in our own back yard — The Santa Monica Mountains. Awesome Note Syncs Your Notes and To-dos with Evernote and Google Docs [Downloads] – September 24, 2010 – This iphone app looks to take notes to an entirely different level . I have already downloaded the lite version to try it out. Sweet Fall Snack: Maple-Butter Spiced Popcorn – September 23, 2010 – I am a huge maple flavored fan. Probably part of my Ohio childhood. I also love popcorn, so combining the two could be a great idea. Souped Up: How to Make Instant Ramen into a Gourmet Meal [Hack] – September 23, 2010 – I have been really getting into ramen lately, but not the pre-packaged stuff. I use my own broth and noodles from the asian market. This is a great post on jazzing things up a bit. I also use thinly sliced carrots in my for a little veg. A little kale might not be a bad thing, either. Where Good Ideas Come From – September 23, 2010 – An excellent talk on creativity combined with a simultaneous mind map video to reinforce the ideas being discussed. This is a great way of illustrating ideas instead of just watching the presenter present their topic. It really adds value to the process. Make a Hardware Chess Set – September 22, 2010 – Another great “maker” project, especially since my son is in the chess club at school and would really enjoy a unique set like this. Perhaps a Father and Son project? Latte art from M Street Cafe, originally uploaded by dewelch. 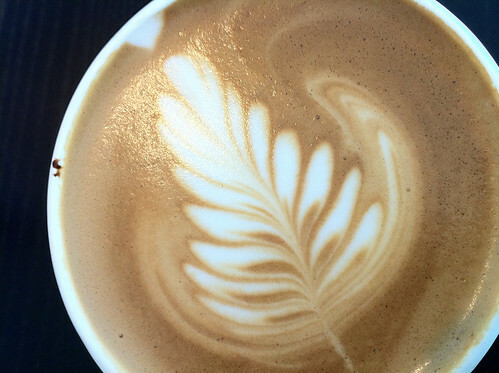 Lovely, lovely latte art (and a great tasting Cubano Latte) made by my favorite barista, Kate, at M Street Coffee. Yum! To make a Cubano Latte, she loads the portafilter of the espresso machine with coffee and then tops it with muscavado sugar. When you pull the shot it blends the sugar with the shot and gives a slight caramelization to the sugar. Very tasty! 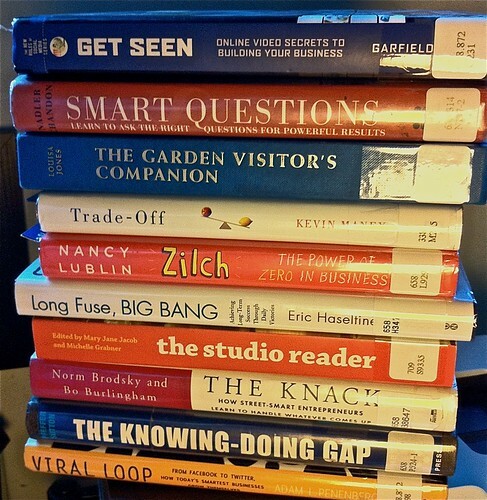 I get the majority of the books I read from the LA Public Library and today they made it even easier to find and manage their holdings – LAPL to Go. Mobile apps are available for iPHone, Android, Palm and more. The screen shot here is from the iPhone app. You can download this app from the Apple App store for free or visit the link below for other mobile devices. 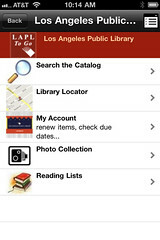 Get “LAPL To Go“, a mobile application that allows you to search the Catalog and Photo Collection, place holds and renew items, find libraries, and receive RSS feeds of recommended books! 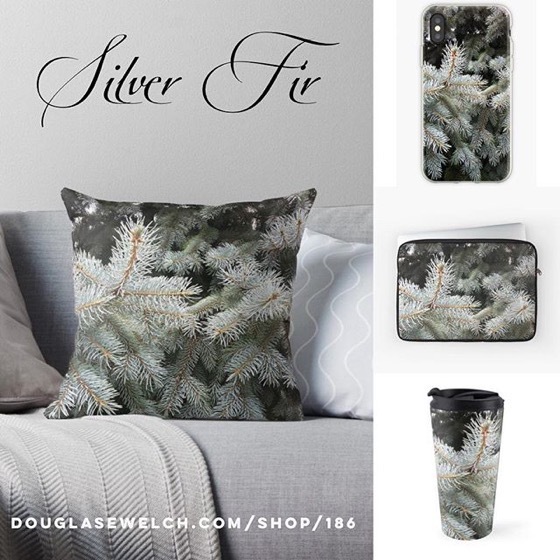 Available for iPhone here. Android, Palm, Blackberry and MS Mobile users should point their mobile devices to http://lapl.boopsie.com. I love animation and this short from Aardman is wonderful. Here is the info from YouTube. “Professor Fletcher’s invention of the CellScope, which is a Nokia device with a microscope attachment, was the inspiration for a teeny-tiny film created by Sumo Science at Aardman. It stars a 9mm girl called Dot as she struggles through a microscopic world. All the minuscule detail was shot using CellScope technology and a Nokia N8, with its 12 megapixel camera and Carl Zeiss optics. Video: Cookie Party Prep – Day 2 – Strawberry Milk Chipsters and much more! Prosciutto and Smoked Gouda Pizza! – September 21, 2010 – I absolutely LOVE pizza, but I am more of traditionalist when it comes to toppings. No veggies for me, please. I want meat — pepperoni (or salami piccante when we are in Sicily), sausage, etc. That said, this recipe is one I want to try our real soon. I LOVE smoked gouda and the combination of it with the proscuitto sounds very interesting. I always have my own red sauce on hand, so it might not be long before this is in my own oven. Doctor Who Bowties are Cool Wallpaper by ~Baxxow – September 21, 2010 – A bit more Doctor Who silliness for your computer desktop. Join.me Is a Free One-Click Screen Sharing and Conferencing Tool [Downloads] – September 17, 2010 – Checking out this new app from LogMeIn.com. I regularly use their LogMeIn Free product to assist people remotely. If this is anything like that, I will like it an duse it. Sometimes there is nothing like showing your screen to someone and letting them watch what you do. One picture is truly worth a 1000 words. Ham, Egg and Cheese Breakfast Cups – September 17, 2010 – More recipes on the savory side of life. I have seen several variations on this “breakfast cup” idea, but have yet to try one. i will add this recipe to the stack and find a morning to give it a try on the family. Geofence Your Friends With Footprint Feed – September 17, 2010 – This is an interesting add-on to location based tracking. I have turned it on for myself only at this point, just to see how it works and what type of value it can provide. It uses Google Latitude as its base. Unfortunately, on the iPhone, it does not run in the background so it will still require me to check-in to update my feed. A Chaos Theory for Change – September 17, 2010 – Some more short, yet great, thoughts on change. They think of it much in the same way I do. Hello, Fall! Cranberry Honey Drop Cookies – September 17, 2010 – Our big Christmas Cookie party will be on us before we know it, so I am constantly adding new cookie ideas to the mix. You never know what is going to Wow the friends. This one looks really good. I have used dried cranberries before and think this might be a great way to showcase them. New in Labs: Video chat enhancements – September 16, 2010 – Always good to see Google trying out new features. Not every one will be a winner, but you need to try a lot to see which are the most useful. Click links to visit Amazon.com for reviews and more information on each book or find more books in The WelchWrite Bookstore. Follow my progress on these books by visiting my GoodReads.com page. 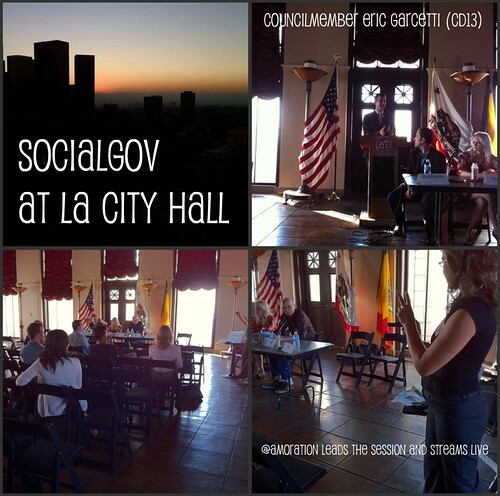 I attended this panel discussion on Monday night high atop LA City Hall in the Bradley Room. Councilmember Eric Garcetti was on hand as were 4 panel members to discuss social media and government. This event was part of Social Media Week LA, part of a series of global social media events. 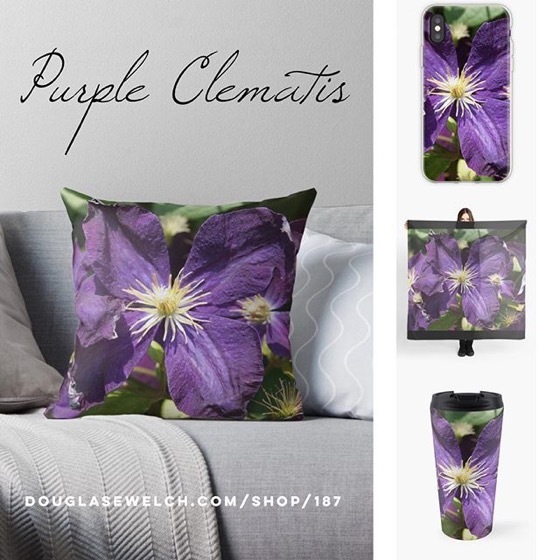 See more in Douglas’ Flickr Photostream. Watch the recorded video stream from SocialGOV. I listened to this interview while driving around on consulting calls and I almost had to stop by the side of the road so I could make some notes. Even in this short interview, Chip Heath, gives some great, though-provoking, information that I was able to put into use immediately. Heath talks about how important it is to use emotion when attempting to change anything. I think that over time I have fallen back more and more on analytical defenses and arguments instead of starting with the emotion that makes the change so important to me. Listen to the interview, and read the book, to find out more about “the elephant and the rider” and how they work in combination to encourage or discourage change. I will be picking up the book as soon as I can to explore these concepts further. Tell me what you think about the interview and the book in the comments. I would love to hear your insight. Dr. Moira Gunn talks with Chip Heath, Stanford Professor in Organizational Behaviour, about his new book, Switch, and learn the key to making real change in our lives, no matter what the change is. Free Walk 'Travels Back In Time' To Westminster Past – September 14, 2010 – Sounds almost worth flying back to London for. Music and learning: do they mix? – September 14, 2010 – Another collection of royalty-free music to use in your new media productions, podcasts, online learning and other creations. Dyyno: Stream Anything From Your Desktop to Justin.tv With One Click – September 14, 2010 – Here is another high quality option for streaming your events, either free or premium plans. Justin.tv has been around for a while, but this software and plans are new. Never-before published photos of Lascaux paintings – September 10, 2010 – An amazing look at something that can’t be seen anymore, due to the impact of people on the paintings. PVC skater dolly – September 10, 2010 – Doing a lot with a little is important for New Media producers and this sweet little dolly can bring a lot of Flash to your productions. A sample video and complete build instructions are included on the site. PVC skater dolly – September 10, 2010 – Doing a lot with a little is always important to New Media producers and this sweet little dolly can add a lot of flash to your productions. A sample video and complete build instructions are included on the site. Honey Walnut & Brie Tartlettes – September 10, 2010 – Crunchy, cheesy, sweet and savory. I am going to try this very soon. I have been experimenting with wonton wrappers the last week or so, too.